In the last post, TheGardenLady reported about three plants that will be coming out in 2008, Hypericum ‘Mystical Beauty’, Philadelphus ‘Snow White Sensation’ and Hydrangea macrophylla ‘Mystical Emerald’. Here are two more plants that are coming out in 2008, according to Novalis, the group that introduced the Double Knock Out and Pink Double Knock Out roses. What’s all the Commotion? 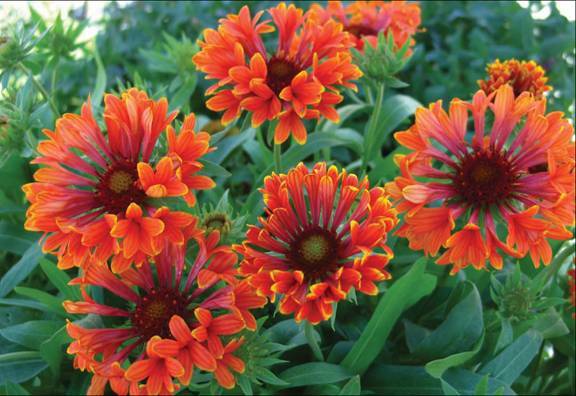 Another world class introduction from Skagit Gardens: a stunning pair of new, vibrant, fluted Gaillardias! Skagit’s very own propagator, John Dixon, is a plantsman and visionary who set out to bring red color into fluted forms of Gaillardia. His push was toward double petals with strong garden vigor. We are thrilled to report that his breeding efforts have been met with success, and with Skagit’s help, we are able to bring you the 1st 2 introductions in the Commotion™ Series. The Series shows strong, hybrid vigor, but still has a manageable, mounding habit. The petal count per bloom is higher than other fluted forms, giving a full, almost semi-double appearance. And color: well, that indeed stirs up a flurry of Commotion™! Early in the season, both varieties offer more red and burgundy tones, with hints of yellow. By summer’s end, orange plays into the red, making these beauties naturals for fall combination plantings. Whether you plant the pair in your perennial border, or use as bold, striking container centerpieces you’re guaranteed to enjoy the incredible number of blooms all season long! Add a touch of gold to your shade garden with this new Box Honeysuckle. Equally at home in the perennial garden or when used as a specimen to infuse an area with color, ‘Edmee Gold’ throws layer after layer of golden branches made up of tiny, delicate leaves. An adaptable shrub, it can also be used as a tall ground-cover under large trees, and makes an attractive addition to the winter garden with its boney, architectural silhouette. Native to the woodlands of China, ‘Edmee Gold’® combines well with the contrasting textures of Cupressus and Thuja. Grow this evergreen in well-drained, organically rich soil with protection from the afternoon sun. Exposure: Shade Spacing: 3’ Height x Width: 4’ X 4’ in 8-10 yrs.